In May of 2013, the White House issued an Executive Order making open and machine readable the new default for government information. You can find government produced data on a wide variety of subjects by using sites like data.gov. However, local and state governments also produce data that has utility to the public as well as researchers. Many times, data at the local level can be more difficult to acquire. This usually has more to do funding issues or a lack of staffing in local government settings than the willingness of people to share their data. I am constantly in awe at how willing local governments or officials at state agencies are to help find and provide their data to researchers whenever I ask on their behalf. 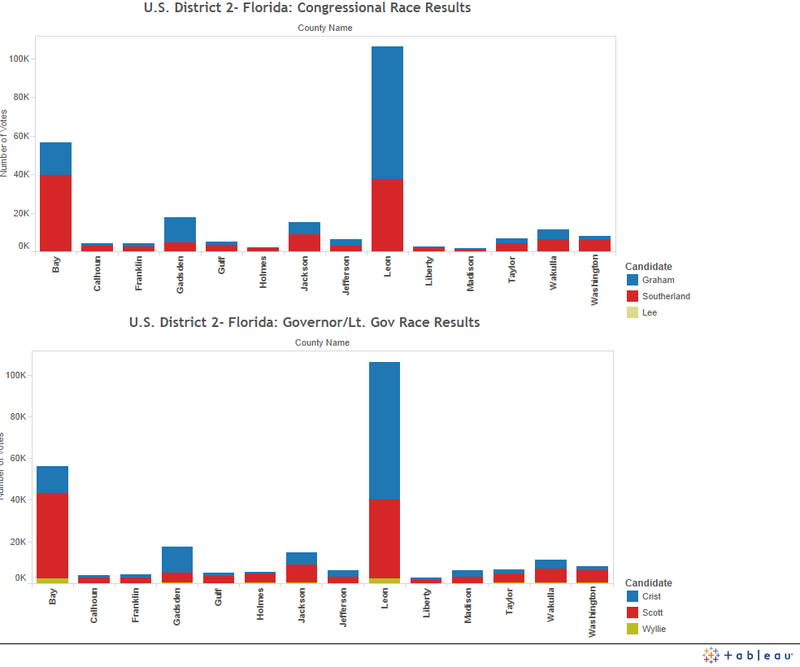 You can interact with the data or even download the visualization along with the data into Tableau by going here. So, what kind of story does this visualization tell? Well, it kind of reiterates what we already know. People have a tendency to vote along party lines, which isn’t really saying much. The point of this post isn’t to show off my sweet data viz but rather to show you how easy it is to use open government information (data!) and analyze/visualize it with free tools from the web. You can use Tableau or a number of other tools to tell stories with open data. With a little bit of time and effort, you can probably make something much cooler than I did.